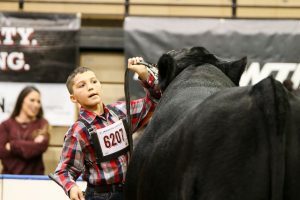 With Joe Sealy on the microphone, the Simmental Bulls were evaluated in Hale Arena. 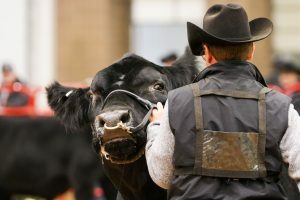 The Simmental Bull Show was the first debut of the Simmentals at the American Royal. 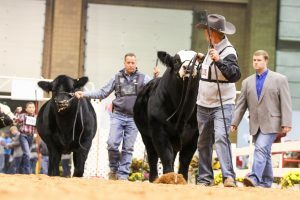 Sealy will join us in the ring again tomorrow morning to evaluate the Simmental and Percentage Simmental Heifer Show. Grand Champion Open Percentage Simmental Bull was awarded to Paisley Nelson of Platte City, Missouri, with PAIS Sweet Ride, 01D. In the Open Purebred Simmental Bull Show, Braelyn Berlowitz of Cushing, Oklahoma, was named Grand Champion with CMFM Dura 224C.